There was fresh spinach. There were potatoes. There were lentils in the refrigerator. With spring in what little prime it gets in South Carolina I didn’t want a hot meal, but it is because summer still isn’t here that I’m not sold on salads yet this year as a meal. What might draw that bridge o’er troubled waters? If you said “potatoes,” then you’re damn right I’m 1/2 Irish. Wash, halve then toss your potatoes in olive oil, garlic, turmeric and salt. Put cut-side down on a pan and bake in a 400° oven for 40m. Let them cool for 5-10m out of the oven while you prepare a bed of spinach, onion and tomato. 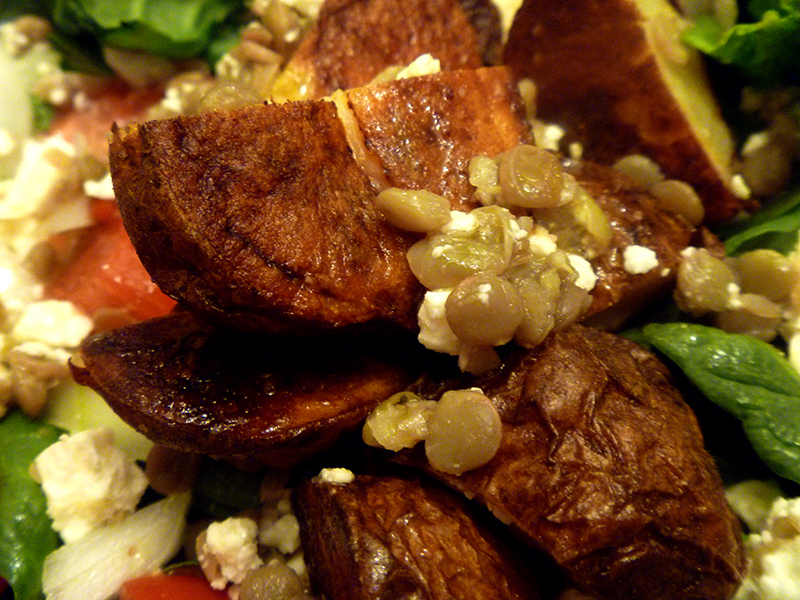 Top that with the halved, roasted potatoes… then top that with (cooked, drained, cooled) lentils and feta cheese. I used some of our house vinaigrette du jour* on it — that’s just 1/4 what was left of our Good Seasons® red wine/olive oil dressing, more olive oil/red wine vinegar, some garlic powder, turmeric and asafoetida (lentils would be afoot). As far as salads go, this one gets 5 spoons both on the flavor and fullness front. This entry was posted in Uncategorized and tagged baby spinach, cooking, feta, feta cheese, filling, fresh, fresh spinach, garlic, healthy, lentils, new potatoes, olive oil, onion, recipe, red wine vinegar, roasted potatoes, salad, South Carolina, spinach, spring, springtime, sweet onion, tomatoes, turmeric, vegetarian, vinagrette, Vinaigrette. Bookmark the permalink.